In 2012 a friend of mine invited me to run with him during the summer. I hadn't run recreationally or competitively in many years. That year I ran my first half marathon in Weston, CT and caught the running bug and now the rest is history. Since that race I have completed 3 full Marathons and 21 Half Marathons and many other races in between. I have met many new friends who have supported me throughout and have been blessed with good health to enable me to achieve many personal records over the past year. One of my goals is to run all of the Abbott World Major Marathons. 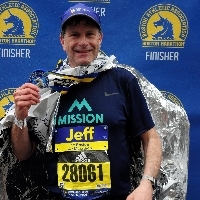 To reach that end and to run the Boston Marathon on April 15, 2019 I have partnered with Mission, located in Southport, CT to raise funds for their Adventure Project. The Adventure Project helps young survivors like, Josh Rubinstein, a student athlete from Trumbull, CT to reclaim their lives and live their dreams. Josh was diagnosed with Acute Myeloid Leukemia last year, and was impacted by a rare condition as a result of his chemo treatment that severely limited his ability to play lacrosse, the sport he loves. His dream is to play in college. I have been fortunate so far to be healthy to live my dream and I want to be able to share this with others as I go through my athletic and racing journey. Proceeds from my run will enable cancer survivors to rebuild and prolong their lives through the exercise, nutrition and community-building support programs made possible by Mission. By running for Team Mission, I want to raise awareness, hope and the funds needed to help the exploding number of cancer survivors get what they need to take back their lives from cancer. Please join me by making a secure online donation here, or by printing out a donor form and sending it in with a check.